My whole family is obsessed with Plants vs. Zombies. It started out innocently enough, with Bob and I playing on the iPad after the kids went to bed but eventually they got hooked, too. Jasper wants to be a bucket head zombie for Halloween this year and Roo's going to be a sunflower. Yeah, we've got it bad. 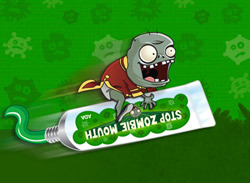 That's why I was so thrilled to hear about the collaboration between PopCap Games, the makers of PvZ, and the American Dental Association (ADA). 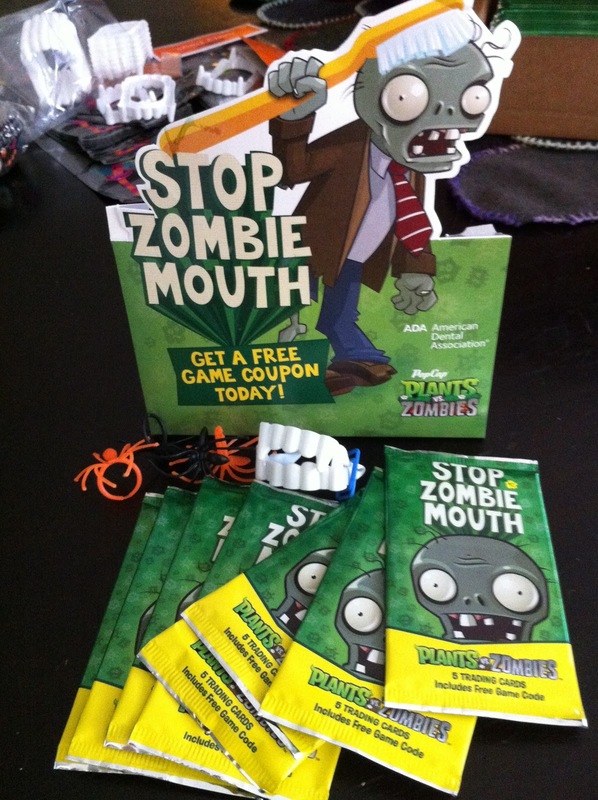 The campaign is called Stop Zombie Mouth, and its goal is to redefine Halloween treats by giving away PvZ trading cards and free game codes instead of sugary, tooth-rotting candy. We gave away card packs along with plastic fangs as favors at our neighborhood Halloween party, hopefully without scarring any kindergartners. If you'd like to give away PopCap’s hit Plants vs. Zombies instead of sweets for Halloween this year, you can download free game coupons at http://stopzombiemouth.com. The free codes are redeemable for the full PC/Mac edition of Plants vs. Zombies (a $19.95 value!) between October 30th and November 10th at the same website. The not-for-profit ADA is the nation’s largest dental association, representing more than 157,000 dentist members. The premier source of oral health information, the ADA has advocated for the public’s health and promoted the art and science of dentistry since 1859. The ADA’s state-of-the-art research facilities develop and test dental products and materials that have advanced the practice of dentistry and made the patient experience more positive. The ADA Seal of Acceptance long has been a valuable and respected guide to consumer dental care products. For more oral health information, visit the ADA’s website at www.MouthHealthy.org. PopCap Games is the leading global developer, publisher and operator of casual video games: fun, easy-to-learn, captivating games that appeal to all ages across PC, mobile, social and other platforms. Based in Seattle, Washington, PopCap was founded in 2000, was acquired by Electronic Arts in 2011, and has a worldwide staff of more than 400 people in Seattle, San Francisco, Vancouver, B.C., Seoul, Shanghai and Tokyo. PopCap’s games have been downloaded over 1.5 billion times by consumers worldwide, and its flagship franchise, Bejeweled®, has sold more than 50 million units. In accordance to the FTC Guidelines and the WOMMA Code of Ethics, I am disclosing that we received PvZ trading cards to give away. No additional compensation has been received and, as usual, all opinions are my own.